What is Alaska Canoe School? Our goal is to teach you basic to advanced canoeing skills so you can plan, and safely enjoy, your own canoe trips on flat water or gently moving rivers. 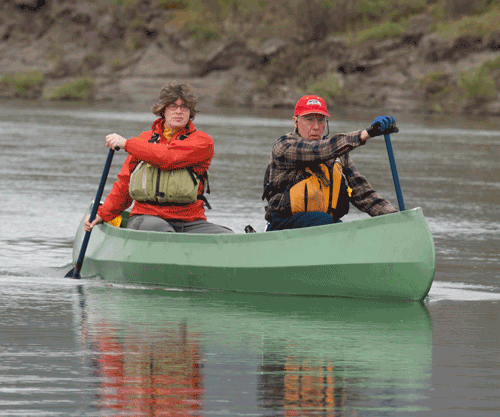 Our canoe courses offer something for paddlers of all levels. Fairbanks has great places to paddle right on our doorstep, from the Chena River flowing right through town, to Tanana Lakes and Chena Lakes. Opportunities abound for those with more skill who want to venture farther afield. Summer 2019 Courses are posted to the Calendar Page. Don’t see a course that suits your needs? Contact us to arrange a private lesson. This year we are offering a Fall Tour to South Carolina November 2 – 10. Spaces are limited. Find more information here. See when the next canoe class is coming up, and schedule a time that works for you! We offer a variety of canoeing instruction for all skill sets. See which one is right for you! If you’ve already had a look at all courses offered, then head on over to registration! Believe me, my young friend, there is nothing- absolutely nothing- half so much worth doing as simply messing about in boats. Muskrat, "Wind in the Willows"
There are many ways to salvation, and one of them is to follow a river. David Brower, Foreword to "Oregon Rivers"
If there is magic on this planet, it is contained in water. Loren Eiseley, "Four Quartets"
©2019 Alaska Canoe School. All rights reserved. This site was designed by Warweb Designs, LLC.